Resolution: With the new FW package 2.19.0; AD300 FW 2.17.0 and AD400 FW 2.17.0 (released 09/23/2011) the firmware looks for a motor clutch switch change after a motor move command. If there is no motor clutch switch change the firmware will order the motor to move again, for up to three tries. If the triangles in the spring cage spindle are not aligned properly the motor will not move enough to change the clutch switch. 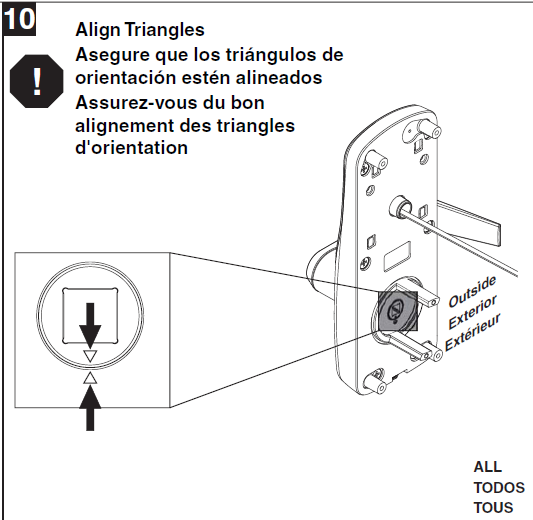 Is is very likely with a lock on the bench; but a properly installed lock on a door will have the triangles centered, letting the motor make a full move and avoiding this three repeats of the motor movement. When the new firmware moves the motor three times without seeing the clutch switch change it reports to the SUS diagnostics that the motor is stalled. Aligning the triangles will let the motor move the full distance and avoid the stall. If the lock is mounted on the door, it is necessary to adjust the mortis/cylinder tightness and spring cage tailpiece alignments, making sure there is no binding or stopping of the spring cage return. Mortis/cylinder and spring cage action returns the triangles to center with a lever release. When the triangles are aligned the stall report and three green Schlage key blinks clear. Just align the triangles per the installation instructions to allow full motor movement. - This will eliminate the SUS motor STALL report. - This will eliminate the three motor move commands and three green flashes. why is my motor squeaking on my sr swing?